LHASA- China has approved construction of a railway linking Lhasa, capital of the Tibet Autonomous Region to Nyingchi in its east, local authorities said Friday. According to the plan approved by the National Development and Reform Commission, the Lhasa to Nyingchi section of the Sichuan-Tibet railway runs 402 km (249.79 miles) from Nyingchi to Xierong, a stop on the Lhasa-Xigaze line. The new Tibet line was one of three rail lines approved by the country’s top economic planning body. The other two are from Ordos in the northern Inner Mongolia Autonomous Region to Ji’an in the eastern Jiangxi Province, and from Datong in the northern Shanxi Province to Zhangjiakou in neighboring Hebei Province. The total investment of the three is 250 billion yuan (40 billion U.S. dollars). The Tibet project will cost 36.6 billion yuan and take seven years to complete. Sate-owned China Railway Corporation will build and operate the line. The designed speed for passenger trains will be 160 km per hour. The line will have a cargo capacity of 10 million tonnes per year. “The Lhasa to Nyingchi railway section is conducive to improving the regional road network and transportation capacity to better integrate Tibet with other parts of China,” said Yang Yulin, a Tibet railway official. After completion, the Sichuan-Tibet railway will form a ring with the Qinghai-Tibet railway, which will bring more economic benefit, according to Wang Daiyuan with the Tibet Academy of Social Sciences. Transport has long been a bottleneck for tourism in Tibet. More tourists will be able to visit Tibet via the Sichuan-Tibet railway, said Wang. The Qinghai-Tibet railway began operations in 2006, introducing railway transportation into Tibet for the first time in history. The railway links Xining, capital of Qinghai Province, with Lhasa. In August, a 251 km (155.96 miles) railway line linked Lhasa and Xigaze, the second city in the region. Tourist arrivals in Tibet reached 12.9 million last year from 1.8 million in 2005. The region’s gross domestic product reached 80 billion yuan in 2013, compared with 34 billion yuan in 2006. 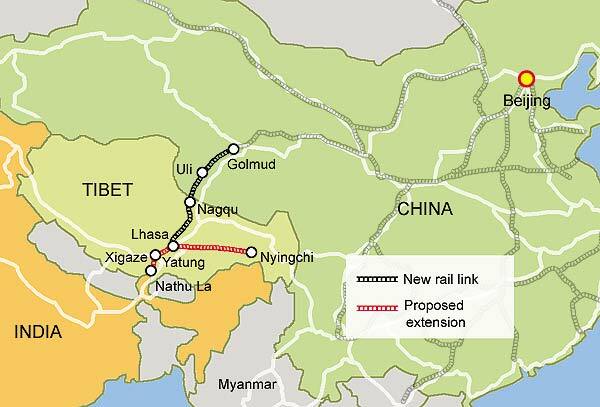 Lines connecting Xigaze with Yadong, Jilung and Nyalam border ports are being planned.